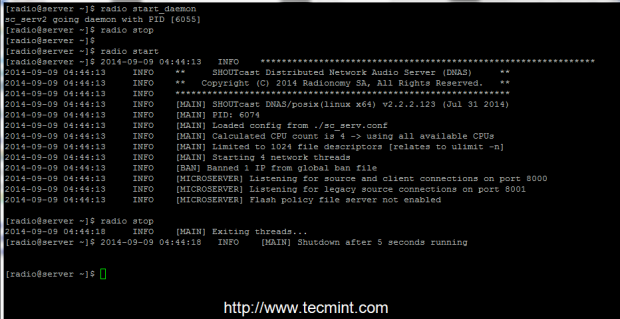 How to auto start Shoutcast service after reboot..? you can add it in the /etc/rc.local as a custom scripts. Good afternoon everyone. I am of Florianopolis SC Brazil and I'm having a hard time by the shoutcast web panel hundreds of auto start . I do not have much knowledge in ssh most know the basics and without someone could teach me what code to put him self start . thank you all now. able to read configuration file. To run the server as a daemon use daemon command option. that using this option requires the creation of logs and control directories, which can be confusing in practice and can lead to server inability to start. If you need a simplified command to start or stop SHOUTcast radio server, login as root again and create the following executable script on /usr/local/bin/ path as in the example below. 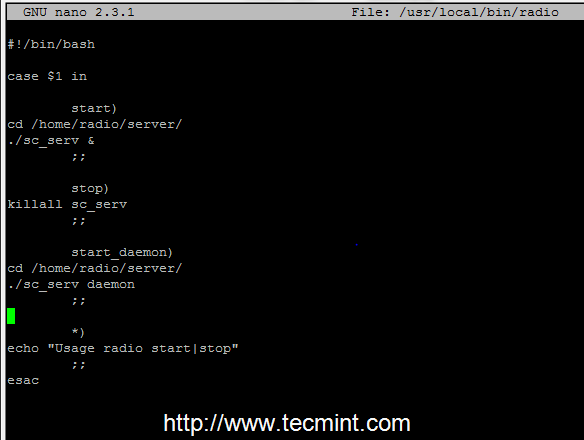 If you want to automatically start the server after reboot, but only on user login (in this case the server was installed on the local user named radio) issue the following command from radio account home path, then logout and login again to verify the functionality, as presented in the screenshot below. That’s it! Now, SHOUTcast server is ready to receive sound or playlists from remote media players such as Winamp from Windows and Mixxx from Linux and broadcast all of the received audio content over Internet. Unfortunately, I do not know how it works either!